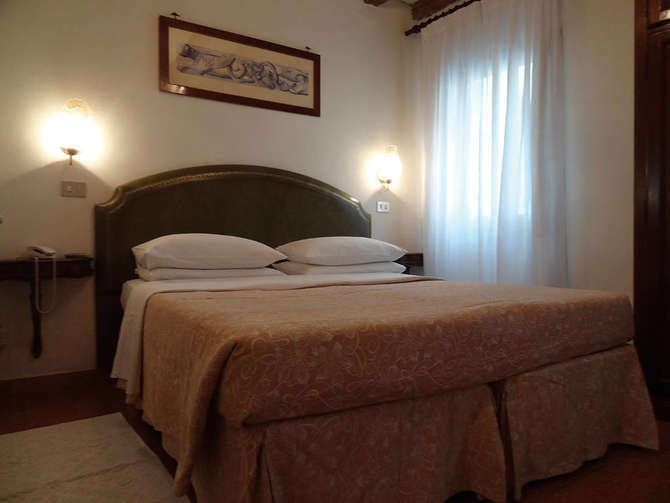 Hotel Minerva e Nettuno is a 1* hotel very well situated. Is a small and beautiful typical venecian hotel. Decorated as most of venecian hotels and with a good service. It only have 30 room some of them with shared facilities.Hotel Minerva & Nettuno only uses electricity derived from sustainable sources.The Hotel has been operating since 1939. Since then the motto is "a client is not a statistical number but a Guest". To respond to and satisfy the various economic needs we provide two different typologies of room: SR and CR SR Rooms: equipped with an en­suite sink unit, and shared facilities (bathroom and shower). Included in there price are the hand towels, Mediterranean breakfast served in a demi buffet style, taxes and service. CR Rooms: with en­suite bathrooms, hairdryer, courtesy line, Sat­TV, air­conditioning (seasonal), safety box, Wi­Fi connection, Mediterranean breakfast served in a demi buffet style or in the room with no extra charge, all taxes and services. * All rooms equipped with anti­panic door handles. * Power by alternative energy sources and cleaning products biologically compatible. * Electrical, heating, water­heating and air conditioning systems are as by law enacted therefore adequates to European­plan. Located in one of most picturesque "sestieri" (quarters) of Venice named Cannaregio, Hotel Minerva & Nettuno leds along "Lista di Spagna", arterial street of the antique city. The Hotel is at 200 meters (218 yards) from the railway station and 300 meters (328 yards) from the winter hall of the Casino of Venice, close to: * Campo San Geremia , one of the largest "campi" (squares) in the city, and the church of Santi Geremia e Lucia, the Palazzo Labia, the Jewish's Ghetto. Of great interest are the five Synagogues and the Jewish's Museum. * Fondamenta Misericordia * Campo dei Mori * Chiesa della Madonna dell'Orto All of them very fascinating spots, where to still meet the pulsating heart of true Venice, bind to her antiques traditions and style of life. The most celebrated monuments like: Ca'd'Oro, Rialto Bridge, Church of Saints John and Paul ( Doges' Pantheon) and Saint Mark Square are within walking distance through the main street.